Sometimes it’s more convenient to create a depth map in less than the original high resolution, such as half or even lower resolution. Creating a depth map in full HD may take a long time, and in some cases such accuracy is unnecessary. Occasionally, drawing a depth map in a low resolution, but with greater detail, is more beneficial than spending the same amount of time making a depth map in the original high resolution. In such cases, time or budget limitations may require you to specify fewer details and less accuracy. Another instance where using low-resolution depth maps is preferable is when some kind of automation is employed for depth creation or editing, and the software takes too long to process full-HD content or produces artifacts, which are less visible in the case of lower resolution. Thus, a company can save time by drawing depth maps for a downscaled video sequence and then increasing the depth map resolution to the initial size before the actual rendering of stereo from 2D-plus-Depth. Ordinary methods of increasing video resolution, however, are not always able to maintain sharp, correct boundaries in the upscaled depth maps, potentially causing visible artifacts in stereo. YUVsoft offers a special tool for increasing the resolution of small depth maps: Depth Upscale. 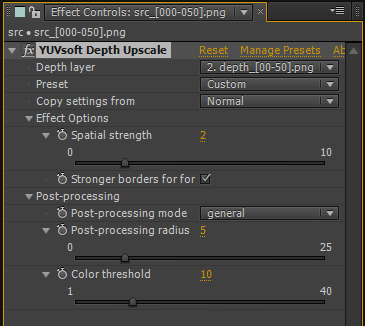 This plugin for Adobe After Effects is conceptually simple and is designed to work in combination with other YUVsoft depth estimation and processing plugins (for example, Depth Propagation). The tool offers several options. The most important, Spatial strength, controls the strength with which boundaries of an upscaled depth map are attached to object edges in the source image. The greater the value of this parameter, the more the boundaries in the depth frame are pulled to the boundaries in the source image. Large Spatial strength values are not recommended for noisy video or video with overly blurry object boundaries, however, since automatically detecting object edges in such situations is difficult. 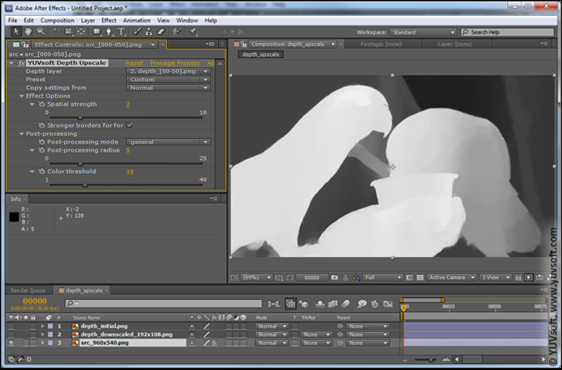 Inputs for the YUVsoft Depth Upscale plug-in are the source and low-resolution depth map video sequences. The plug-in then returns to you an upscaled depth map video as the output. The resolution of the output depth map is equal to that of the source video. Depth Propagation plugin for Adobe After Efects. Depth Effects plugin for Adobe After Effects – allows to obtain detailed depth for static scenes and background areas. Depth from Focus plugin for Adobe After Effects, works well for scenes where foreground objects are blurred and where manual rotoscoping is an undesirably complex and expensive option.